I happen to understand the technology just fine and all my cars have active curve lights and other than the ML also have corner illumination. What I have done is to point out that the ML doesn't have the corner lighting included in the US even though the headlights are designed for it and the corner illumination is included in other countries. This is unique to the ML as other MB models have the corner illumination included. But you can't tell by the window sticker since Mercedes lists the Lighting package as active Curve illumination wether the corner illumination is included or not. Since I purchased the SL before and have both options as standard (even though corner illumination is not listed on the sticker) and got the ML with the Lighting package (saying the same thing on the sticker) I was surprised by the omission. Corner illumination is not a stand-alone option and can't be ordered on any MB model by itself. Whatever helps you sleep. However, your countless hours researching options seems that it isn't helping. I order all of my cars. I'm particular about the options but my time and sanity are worth more than the relentless handwringing. The fun of ordering a car is to get a car that excites you, not avoiding a car that you're worried if you got an extra option that you don't use. I can see the defensive discussions/speeches in your holster that you are having or will have with anyone who checks out your new fancy car. Your statement that my "countless hours researching options seems that it isn't helping." doesn't make any sense. I'm getting EXACTLY the vehicle I want BASED upon those hours of research. Maybe you need to rethink your sentence. If I'm dropping 60 or 70 grand on a vehicle, I want to make sure that I get exactly what I want, that's all. Money is important to me and I want to get exactly what I want for my hard earned money. I've done my research in my spare time, so it's no big deal. The main question I've had, and the reason for this thread based upon its title, is whether to stay with that ordered vehicle or wait for the GLE. Based upon all of the discussion, pictures posted by Wolfman and other research, I am inclined to stay with the vehicle I've ordered. Thank you, I hope you enjoy your vehicle as well, whether it's fancy or not. 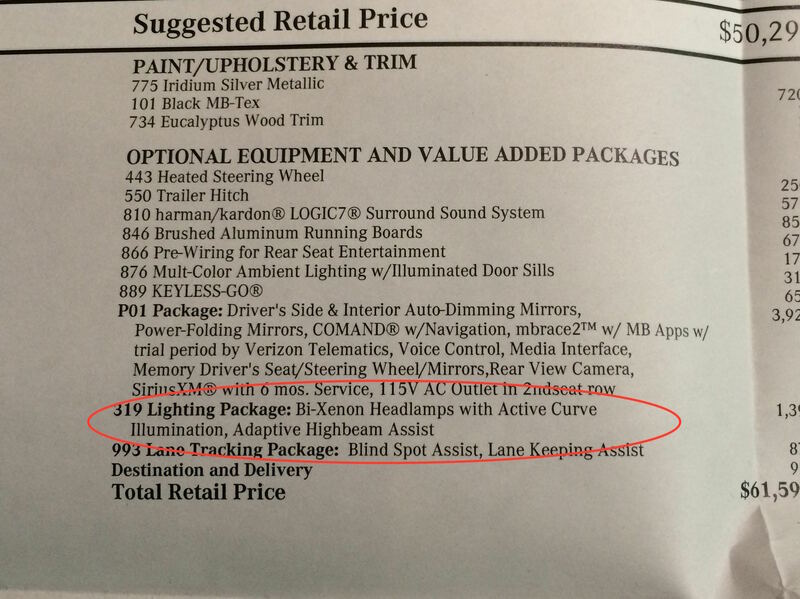 "One note is that the current ML does not have properly working curve lights when getting the Xenon light. 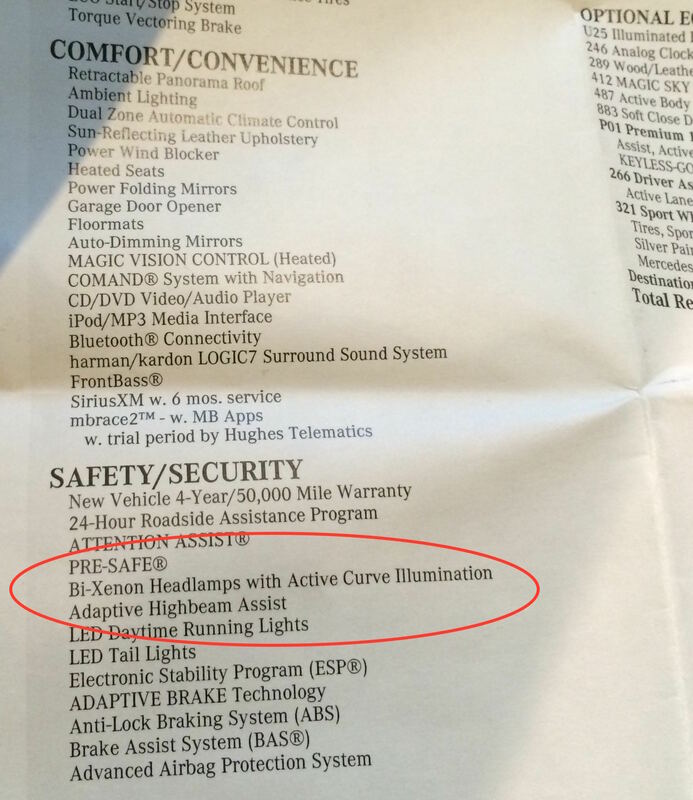 Even though it's listed on the sheet, it's actually not there..."
I am saying the curve lights work fine. Can you show me where MB says the ML with the active curve lighting package includes cornering lights? That was my very first comment which I later clarified (due to you pointing it out, which was appreciated). I had simply bundled the 2 features together as Mercedes does as well (as a line item on the window sticker). 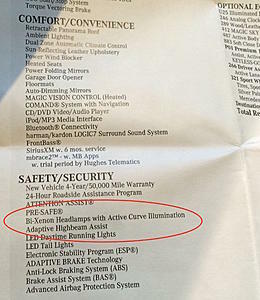 He's confusing "Active Curve Illumination" With "Cornering Lights". My Active Curve Illumination works perfectly also. If you respond, it might help to read the follow-on threads as well where I clarified this a bit more. There is no confusion on such simple, old tech stuff like curve & corner lighting. It's been around for a long time. I have attached the window sticker of our two current MB's. One includes corner illumination, one doesn't. Last edited by Wolfman; 03-12-2015 at 03:34 PM. Lighting package or Multi-contour seats? Works on my ML. Never really paid much attention to it untill early one morning last week when it was very foggy. That's when I could really see how it worked as I turned the steering wheel. What's are your opinions on whether I should get the multi-contour seats OR the lighting package? I've been going back and forth forever... Probably as much thought into my order as you and can't find any good information or opinions on the net. What say you? Lights or seats? Why? The lights are fantastic. If you a lot of night driving......that's a no brainer. If it's areal toss up for you, why not just get both? I do not have multi-contour seats so I have no idea about them, but I will say the standard seats are great and very comfortable on a long day of driving. I am really glad I have the lighting package ad would highly recommend it. Great visibility at night. I have seen too many posts here from people that did not have the lighting package and are now spending a lot of time and money trying to improve their lights. Last edited by Kartergreg; 09-24-2015 at 10:00 PM. I have a 2013 and the standard seats are very nice even after eight hour road trips. Doesn't he 2016 have a better MC seat upgrade than the previous year? If so, I'd get both. I have now had my 2015 ML 350 for about 5 months and I will tell you that I love it. My last 2 vehicles were a Lexus RX 350 and a BMW X5. I love everything about the ML 350......except for 1 thing. The Lexus did not have any upgraded seat options. My BMW X5 had the multi contour seat option and I absolutely loved their design and function. So when I ordered the ML, I ordered the multi contour seat option. Unfortunately, I have been extremely disappointed with that 1 option. On the BMW's multi contour seat option, the entire seat can literally be broken into pieces and reshaped, it's amazing. BMW uses electric motors to create an UNLIMITED amount of shaping all throughout the seat. The back of the seat breaks into 2 pieces and can be individually bent to perfectly shape to your back. I don't have any back problems, but my back was SO comfortable in that seat. The bottom of the seat is the exact same way. Even the bottom cushion could be electrically extended outward to provide more back upper thigh support for people who are taller. No matter how tall or what shape you are, you can perfectly form the BMW multi contour seat to fit you. After I adjusted the multi contour seats in the BMW, it was more comfortable than any seat in my house. On the MB ML, the multi contour seat option is just the STANDARD SEATS, only with air bladders installed in them. So you just pump air up or down in various places in the seat. This is NOT multi contour to me. Unfortunately, the MB ML multi contour seat option is worthless. In my mind, the MB ML beats the BMW in every way....except the multi contour seat functionality. I am extremely disappointed in MB's design and function. In the future, hopefully, MB will take its cue from BMW and simply use the BMW multi contour seat design. So after all of that research and handwringing you still got an option that you didn't like? Maybe it is smart to listen to current owners rather being so defensive. That way you would have saved your "hard earned money". I'm just busting your walnuts. I agree that the seat upgrade isn't worth it and BMW's upgrade is phenomenal. I believe that the 2016 GLE seat upgrade is much better than the 2015 ML option. There a thread here somewhere. Before I placed my order I had tried researching the multi contour seat option on this forum. At the time, there was 1 person who had experienced this option and vaguely said they didn't like the option, but not much detail as to why. Unfortunately, neither of the 2 MB dealers in my area had any vehicles with this option on the lot. Even the sales people were not able to give details as to the operation of this option. As it turns out, the multi contour seat option is not extremely popular, not very many vehicles come with it. After experiencing it on my vehicle, I fully understand why it's not more popular. That's why I wanted to give a detailed review of the option to save anyone else the trouble and money. I have looked at the MB website to see if the '16 GLE multi contour seat option is different, but the description of the option is identical to the description on the '15 ML. Maybe the '16 GLE multi contour seat option has a different functionality, I don't know, but the option description reads the same as it did for the '15 ML. But I think it is the same on the '16 GLE as it was on the '15 ML. I have done a search on this forum for "multi contour" and I couldn't find a thread that talked about this option being different than the '15 ML. If the '16 GLE multi contour seat option is the same as the '15 ML's multi contour seat option, I would strongly advise against getting this option, in my opinion it's not worth it. You can read my detailed description above and decide for yourself. Just trying to save anyone else the trouble and money. Last edited by dprice03; 09-26-2015 at 02:25 AM. Have had Multi seat option on 2 MB's. If I was factory ordering I wouldn't be without it. Used the massage feature every day coming home from work or during a long drive. The active side bolsters are a great feature that you very soon get used to. Mine were in E Class. To each his own. Last edited by greasykid; 09-26-2015 at 03:23 PM. The ML seats are SUV seats; they are comfortable but could be better. No doubt. It does seem that the multi-contour seat option in the ML/GLE also doesn't have some of the features that other MB's have, in terms of adjustments. But the tech used for the multi-contour with it's air pillows is sound and in many ways better than the BMW. Too bad they didn't add those features to the ML (seat cushion adjustment for tall people, upper back adjustment, drive-dynamic seats? - not sure if available). I find that the seats in our SL/S-Class easily beat the seats of our 7 series BMW. Last edited by Wolfman; 09-26-2015 at 02:34 PM. When I read the option description to my wife, before I ordered, she was excited to try the massage feature of the MB ML multi contour seat option. I had no interest in that feature. However, when we got the vehicle, she was disappointed. I think she had the idea of a real massage, which was clearly expecting too much. Like others have said, even at the highest setting, the massage is not that powerful, but I don't think it was meant to be, you're driving after all, not at a massage salon. To me, MB calling this option a multi contour seat option for the ML/GLE is just not accurate. To me, multi contour means the seat can reshape into, well, multi contours. But the seat doesn't really reshape, it's more accurate to say it's a full seat lumbar adjustment, various parts of the seat have lumbar adjustment through the air bladders, but the overall shape of the seat remains the same. I think that's a more accurate description. The BMW X5's multi contour seat option with its electric motors is truly "multi contour", as that option truly has the ability to completely change the shape of the seat, therefore, giving it the ability to have..... "multi contours". When you can literally bend separate parts of the seat back to fully contour to your individual back, to me, that's "multi contour". Like it's been said, to each his own. To some, this may be splitting hairs multi contour vs. full seat lumbar adjustment, but if someone is expecting one thing and gets another, they will be disappointed. My advice to anyone contemplating the MB multi contour seat option is to find an MB vehicle with the multi contour seat option to sample before you buy. I wish I had been able to sample this option before I ordered it, I definitely would not have ordered it. For me, hopefully, MB will change the design and functionality of the multi contour seats using the BMW X5's design and function, because other than this 1 item, I think the MB ML/GLE is better than the BMW X5. Last edited by dprice03; 09-28-2015 at 02:00 AM. It's tough coming from another brand and just looking at options (and their description) without having a chance to experience how they work at the dealer. Every brand applies a different philosophy and the difference of the functionality even by model (see the earlier post about cornering lights where different models offer varying functionality without putting it on paper). I remember searching for some specific options at our dealers which had countless ML's in stock. Very few had the lighting package and keyless go, panorama roof and any interior upgrades, but tons of running board (with/without LED's) and trailer hitches. I ended up with both but neither had much importance to me. You're exactly right Wolfman. In an ideal world, you would be able to park the MB ML/GLE equipped with the multi contour seat option right next to the BMW X5 with the multi contour seat option and simply hop into each one and compare them, on the spot. But of course we don't always live in an ideal world. In my case, there was no MB ML with the multi contour seat option to even sample and the sales people seemed clueless on the option, so I just ordered it on the ML hoping for the best. On the X5 it didn't have the massage function as part of the multi contour seat option, I think that's why my wife was interested to try it on the MB ML. With the X5 design, they purely used several different electrical motors in various parts of the seat to reshape and "multi contour" the seat, so there was no air bladders in their seat for massage (I owned a 2012 X5). But for me, the massage function just doesn't float my boat, it might for others, but it just doesn't for me. One interesting thing on the cornering lights. BMW had a very similar option package on the X5 (Xenon lights with cornering capability). 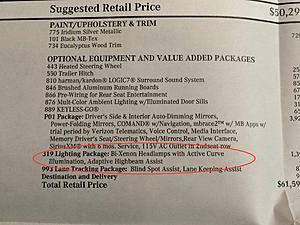 So when I ordered the ML, I immediately checked off the box for the MB lighting package that the description seemed similar. Sure enough, when I got the MB ML, the headlights operated in the same way as the BMW X5 (moving when you went around corners, etc.). So I was very happy with that option, it was exactly what I was expecting.